The Crossroads series pays homage to the style and sound of classic instruments from 1930’s America. The 30’s were a time of hardship all across the USA with the Great Depression bringing communities to their knees and the strife and pain of poverty and famine recorded in journals and diaries and of course in song, all across the country. Some of what are now regarded as the finest and most influential musicians in the world created a rhythmic sound during those years and sang of their troubles, a sound we now think of as the blues. The guitars used to play this music weren’t fancy, or ornately decorated or adorned with expensive lacquers, they were straightforward and functional, but in a lot of cases these instruments were still quite precisely engineered for the day. With a really significant cost to the musician in those days it meant that guitars of this era had to play well and last a long time, often to be passed on through family generations. 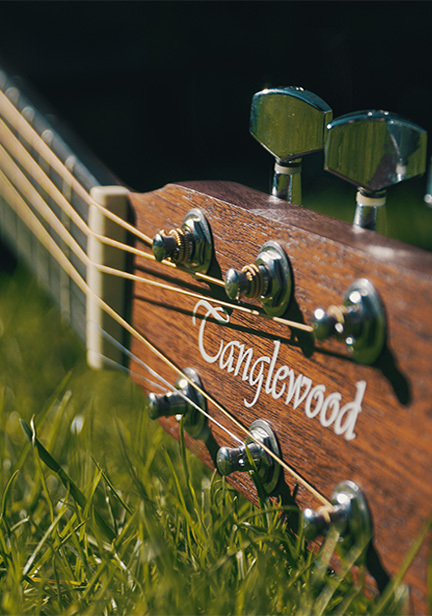 To create an instrument that evokes these traditional values, so often overlooked in our modern society, we at Tanglewood had to commission the services of a very special luthier, none other than Michael Sanden, the man behind Tanglewood Masterdesign. Michael is the creator of the Sanden Guitar company in Sweden, and now the chief design consultant for Tanglewood Guitars. Michael has that Scandinavian affinity with natural wood. He starts with the tree, selecting timbers that will sound good together, making the soundboards a precise measurement so they will flex and respond to the players attack, and then he braces the instrument with his own patterns to make each instrument have its own personality. It’s not just the special bracing, or the woods that are selected, or the construction method even. All these are vital components for any guitar… but on Crossroads Michael wanted to create something very very special. He wanted to make a guitar that could have the sound that any musician, professional or amateur could appreciate and he demanded that the neck profiles and bridge contouring and fret inlaying should be implemented without regard to the price of manufacturing, to proudly reflect the Tanglewood ethos of outstanding value and performance. When Michael was looking for a colour finish to compliment the earthy, naturally authentic signature of the Crossroads, the vivid autumnal palette of dark brown that was finally decided upon was likened by some of our friends to be inspired by the timber shading that old whiskey barrels of the last century looked like. 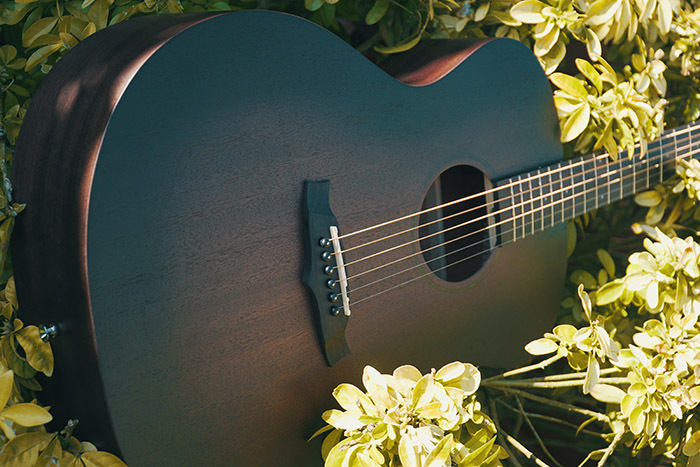 So for the very first time, we have created an all new Tanglewood colour finish, exclusively for the Crossroads series models and we will call it…Whiskey Barrel Burst!